Shane Lowry reckons that “something special could happen” if he gets into contention at one of the four majors next year. The popular Clara man, 28, pulled the curtain down on a stellar 2015 season on Sunday and headed straight from the Nedbank Golf Challenge in South Africa to the Irish Youth Foundation’s Excellence in Sports Awards gala in Dublin last night. Host Pádraig Harrington presented Lowry with a Waterford Crystal designed Special Achievement Award at the DoubleTree by Hilton Hotel in Ballsbridge in recognition of his breakthrough victory in the WGC-Bridgestone Invitational in Akron in August. It was a win that catapulted the former Irish Open and Portugal Masters champion to the next level in the game but the world No 21 is keen to take another big step in 2016, targeting another victory (or two) and a place in Darren Clarke’s European Ryder Cup team. “I’ve been on tour for almost seven years now and I feel like I am getting better and better every year,” Lowry told presenter Joanne Cantwell. “As Padraig Harrington will tell you, to win the big tournaments and obviously the majors is No 1 goal. Next comes the WGCs and to win one of those for me this year was massive. Knowing he can compete against the best and beat them was huge for Lowry, who admitted that he needed that boost to his confidence. “I didn’t even know what it was. To shoot that score with no bogeys that day was massive. It was massive for me just to get the bit of confidence that I think I need to kick on and hopefully do bigger and better things in the coming years. “That’s what it’s all about (beating the best). Pádraig has got three majors and we all know the majors is where it's at. And to compete in majors you have got to feel that you can beat the best and I really feel like I beat the best that week. Asked if Harrington was always “banging on about the two Opens and the PGA,” Lowry joked: “Yeah. He never shuts up about them. “Myself and Padraig play a lot of chipping competitions for a few quid around chipping greens and he chipped in in Switzerland about a year and a half ago and it was quite similar fist pump to the one he did in the US PGA. So to be honest for me it is great to have someone like Pádraig around. Assessing his poor end of year performances in his last four starts, he said: “I struggled towards the end of the year. I came back and finished second in the British Masters, which I felt I should have won. “I played in Turkey and top tenned it there, which was ok. The last few weeks haven’t been great but that’s golf. Golf is a funny game sometimes and I felt like things were going really well and I was playing quite well but certain parts of my game let me down over the last few weeks. Asked about his goals and whether he writes then down, he beamed: “To be honest I just hope for the best. I am not one to set down targets. "I have my coach and my caddie and a few others that help me along the way. We look at things that we want to do and next year for me the big thing is the Ryder Cup and if I can play in the Ryder Cup, that would be great for me. Michael Conlan’s heroics in Doha, which saw him win Ireland’s first-ever gold medal at the men’s World Boxing Championships, were rewarded with an outstanding achievement award. AP McCoy, who this year retired after riding 4,358 winners and being named champion jockey 20 years in a row, also received a lifetime achievement award. The Irish Special Olympics team, the Irish showjumping team and the Irish men’s rugby team won the three team awards on the evening while international mountain biker Greg Callaghan won the alternative sport award. With the 25th anniversary of Italia ’90 being remembered during the summer, the Irish team from that World Cup won the Reeling Back the Years Award. The awards are held in aid of the Irish Youth Foundation, which supports vulnerable children and young people living in disadvantaged circumstances around the country. Rory analyses "happy" Tiger: "Winning majors isn’t really about how he swings it, it's about feeling the pressure under the gun"
Shane Lowry's sensational run of form continued today when he brilliantly qualified for the US Open by winning the Sectional Qualifier at Walton Heath as Pádraig Harrington missed out by six shots. Shane Lowry didn’t feel well but said he was happy to shoot a one over 72 on his US Open debut. Credt: golffile.iePadraig Harrington avoided some capital punishment in Washington DC to get his US Open challenge off and running. As debutant Shane Lowry staved off tummy trouble to open with a one over 72, the triple major winner made a bogey six at his final hole for a level par 71 that could have been three shots lower - or higher. The Dubliner avoided total disaster when he tangled with the woods after a pull-hook ricocheted into the trees Rory McIroy Augusta style at the 11th, fell foul of a fidgety marshal at the 15th and crashed his tee shot into a towering crane at the 18th. But while he limited some of his wild tee shots to three bogeys, he also had four great birdies and could easily have had four more with better luck on the greens. 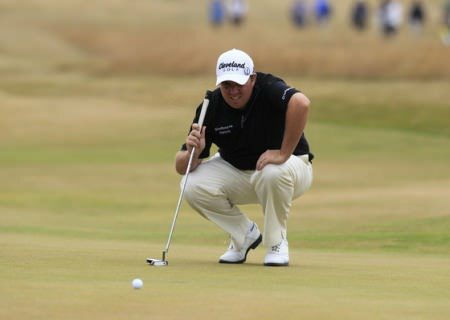 Shane Lowry 2.0: "I don’t think I’m even close to fulfilling my potential"
Comparisons are odious and while Shane Lowry believes that living in the shadow of major winners like Pádraig Harrington, Rory McIlroy, Graeme McDowell or Darren Clarke is no bad thing, he's slowly finding out what makes him tick as he bids to fulfill his potential and join them in the game's elite.